This small sitting park honors Private John J. Dwyer, a native of Queens who served and died in World War I. Dwyer grew up at 18 28th Street in Long Island City. He served as a Private First Class in Company M, 71st Infantry Regiment of the New York National Guard. Private Dwyer was killed in action on October 2, 1918, just 40 days before Armistice and the end of the war. Private John J. Dwyer Square lies at the intersection of Northern Boulevard, 34th Avenue and 47th Street in the section of Long Island City that is commonly called Astoria. On May 4, 1970, Astoria and several other Queens neighborhoods, including Hunter’s Point, Steinway, Blissville, Dutch Kills, Bowery Bay, and Ravenswood consolidated to form Long Island City. Officials debated over a name for the new union, finally agreeing to name it after the newspaper that had started operation there in 1865, the Long Island City Star. 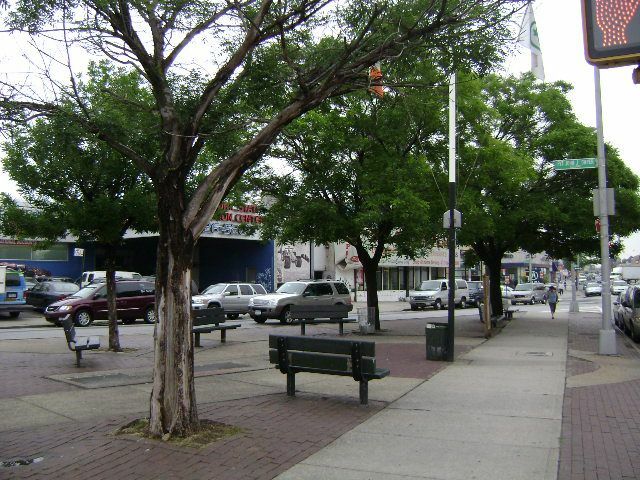 Located in the northwestern Queens neighborhood of Astoria, Dwyer Square lies near an old Native American trail (Woodside Avenue) that served as the main road from western Queens to the village of Newtown during the early American Colonial Period. The road ran along a tongue of dry land between the swamps of Long Trains Meadow (towards present day Jackson Heights), Wolf Swamp (towards present day Maspeth), and Burger’s Sluice (along present day Northern Boulevard). Hessians during the American Revolution (1775-1783) garrisoned this strategic point. In 1713 Isaac Bragaw, a descendant of one of the earliest French Huguenots in New Amsterdam, purchased this land. During the early 19th century, William Gosman purchased the farm. (Gosman is also known for having surveyed and laid out the area’s streets around 1875). Also nearby lies Northern Boulevard, an important six mile road connecting Flushing to Hunters Point. It was originally named Jackson Avenue for Turnpike President John C. Jackson, whose leadership and efforts made the road possible. Costing nearly $40,000 and opening on July 13th, 1860, the highway was originally composed of milestones, a gravel roadbed and a tiny tollhouse and gate where travelers would pay a nine cents fee for passage. Foot traffic, however, was free. In September 1980, the City of New York rededicated Dwyer Square. The square contains a flagpole with a yardarm that flies the United States, City of New York, and Parks flags; brick and concrete walkways; benches; and five trees, including three Japanese pagoda trees (Sophora japonica), a honey locust (Gleditsia tricanthos), and a green ash tree (Fraxinus pennsylvanica).